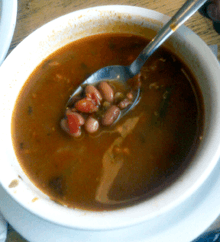 Frijoles charros (cowboy beans) is a traditional Mexican dish. It is named after the traditional Mexican cowboy horsemen, or charros. The dish is characterized by pinto beans stewed with onion, garlic, and bacon. Other common ingredients include chili peppers, tomatoes, cilantro, ham, sausage, pork and chorizo. It is served warm, and is usually of a soupy consistency. ↑ Rick Bayless with Deann Groen Bayless (2007). Authentic Mexican: Regional Cooking from the Heart of Mexico. New York, NY (USA): William Morrow. pp. 239–240. ISBN 978-0-06-137326-8. Retrieved 5 January 2013. ↑ Nancy Zaslavsky (1995). 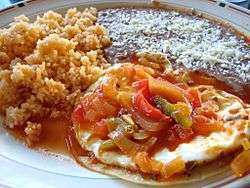 A Cook's Tour of Mexico. New York, NY (USA): St. Martin's Press. p. 31. ISBN 0-312-16608-7. Retrieved 5 January 2013.